I’ve always used headphones to listen to music, podcasts and audio books because all the earphone buds I tried in the past were *really* uncomfortable. So you can understand my surprise at finding the Logitech’s Ultimate Ears 700 noise isolating earphones I’ve been testing for the past 6 weeks comfortable with excellent sound quality. If you spend a lot of time listening to music, podcasts or audio books don’t listen to cheap headphones/earphones which sound horrible and can damage your hearing by forcing you to turn the volume up too high. They’re passive noise-isolating upto 26 dB, blocking a lot of outside noise like buses, trains, city sounds etc by fitting snugly into your ear. Being passive means they don’t need batteries which are required by all noise canceling headphones. Impressive sound quality for such a small audio package. Ultimate Ears custom earphones are used by 75% of the world’s touring professional artists for live performances. Can be worn comfortably in hot, dry or humid Australian weather when wearing headphones would have made your ears feel hot and sweaty. Are tiny themselves and fit in a small plastic case which can be slipped into your pocket or handbag. Good quality headphones with noise cancelling or noise isolating features are usually quite bulky. A lot of people use the cheap free earphones which come with their iPod or Mobile phone. So in comparison the cost of buying Logitech Ultimate Ears 700 (AUS $200-$299) seems really high because earphones all look quite similar, the quality difference can only be heard by trying them on. You’ll have to clean ear wax particles out of them regularly because these earphones are stuck inside your ear canal. Wearing them while exercising can cause “clanky” noises as the earphone cables get jerked around. 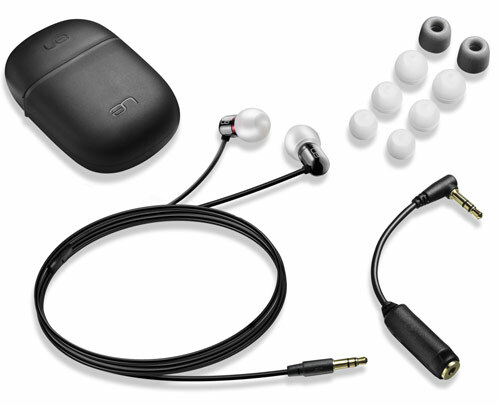 Logitech Ultimate Ears 700 Noise-Isolating Earphones are sold in Australia for between $200-$299 in a package including plastic hard case, silicon ear-cushions (S,M,L), two sets of ComplyTM foam ear-cushions, instruction manual and airline attenuator cable. A big advantage of in-ear headphones is the noise isolation they provide, an area in which the Ultimate Ears 700 in-ear headphones generally perform well. They provide up to 26dB of passive noise isolation from external sources, so you won’t have to turn up the volume excessively to hear the music over your surroundings. In practice, we found most external noise was isolated fairly well provided music was playing at a reasonable volume. Excessive noise sources, like trains, could still be heard but nearby conversation and other natural sounds were blocked out. WIRED Exquisite sound reproduction in an insanely small package. Handy in-flight attenuator saves you from Captain Blowhard’s eardrum-exploding announcements. Fuller, richer base and wider frequency response than previous UEs. TIRED Spendiferous. Cable noise will be distracting for joggers or anyone planning to use the headphones while exercising. Despite its redesign, the pocket case is still too small to fit all the accouterments. I’ve been using passive noise cancelling earphones for a while: first sennheiser, and then – when they were stolen – Apple ones. One possible downside you missed is the risk of losing track of your surroundings when walking and listening to something – this was a bigger problem with the sennheisers than the Apple ones, the latter letting in more of the surrounding noise. Great review on the product. I have been looking for a good set of ear phones b/c I am always using my ipod. Do they hurt your ears since they are stuck so far in there? That is the only thing holding me back. Great review though! Earphones are awesome! I work in a factory where it’s extremely noisy and we have to wear ear protection. I’m able to put my ear protection over my earphones so I can listen to my Ipod. It helps to make the day go by faster. Thanks, as I get older my hearing is more sensitive and these have worked great.